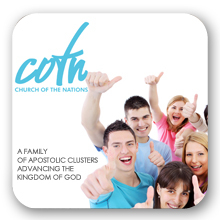 We are an international family of churches relating through love and commitment to see the Kingdom of God extended on earth. The Church today is a kaleidoscope of personalities with an even more diverse palette of passions and motivations for living out this life we have in our Saviour, Jesus Christ. Within the Church of the Nations' family, the heart that is in us determines what we all agree are our values, no matter where in the world we live and serve our Lord.